Tahune AirWalk offers a variety of tranquil forest walks which will definitely calm the mind, body and soul. 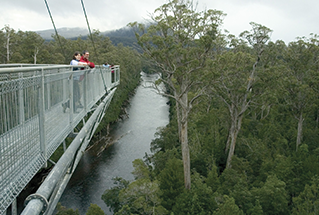 The AirWalk averages heights between 20-30metres above the forest floor, with the very last section, the cantilever, sitting at a height of 50 metres above the river and is where you will get the best views. The Airwalk is located 90 minutes’ drive away from Lenna.